You are here: Home / Cat Behavior / How Can We Help Our Cat Love His Litterbox? How Can We Help Our Cat Love His Litterbox? I have a 5-year-old neutered male cat who has been having urinary tract infections for 2 years now. Prior to this, he always used his litterbox, but since the first infection, he’s been spraying all over the house. Of course all that comes out is urine. I’ve tried cleaning the areas with enzyme cleaner, followed up with Feliway and it made no difference. We have three boxes (three cats in the house) that we keep clean. Any advice would be very appreciated as we are at our wits’ end and getting rid of him is out of the question — he’s our baby! Siouxsie: It’s not uncommon for cats to stop using their litterboxes after experiencing chronic urinary tract infections. Thomas: The pain creates a negative association, which makes the affected cat want to avoid the litterbox for fear that he might experience that discomfort again. Kissy: You’ve done all the right things so far, so congratulations on that. But we do have some tips that we think will help your cat learn to love his litterbox again. Thomas: Enzyme cleaners are good, and they do help a lot. But we think you should get the big guns! Celebrity cat behaviorist Jackson Galaxy used Fizzion, a carbon dioxide-based cleaner, on one episode of his TV show “My Cat From Hell,” and since then many people have tried it and given it great reviews. Kissy: Get yourself a hand-held black light and go around your house, using it on any surfaces up to about 12 inches off the ground and on the floors and carpets near the walls. The cat urine will glow under the black light. Wherever you see a glow, take the Fizzion to it. Siouxsie: While you’re taking care of the old urine deposits, make sure he doesn’t make any new ones. Kissy: We haven’t used it ourselves, but Dr. Elsey’s Cat Attract litter has gotten great reviews for its effectiveness in retraining cats to use their litterboxes. Cat Attract litter is available at most big-box pet supply stores, and if one of your local independent stores carries cat litter, they may have it too. Siouxsie: We don’t know how many pet stores carry Fizzion, but you can order it online if you can’t find it locally. And just about every pet store anywhere carries hand-held black lights. Kissy: You may need to isolate your cat in one room, preferably one without carpets, while he learns how to use the box again. Siouxsie: But you don’t have to do this all day. 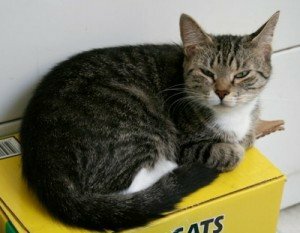 Most cats will use the facilities within an hour after they eat, so put him in the room with his box for about an hour after breakfast and an hour after dinner. Thomas: Of course, if he pees before an hour is up, feel free to let him out. Give him lots of love and praise every time he successfully uses the litterbox. Kissy: This advice assumes that you feed your cats in meals rather than leaving food down all day. If you free feed, we’d urge you to strongly consider going to scheduled feedings of two meals a day. Eating twice a day rather than grazing all day is closer to the way cats eat in the wild, and scheduled feeding is a great tool for weight management as well. Siouxsie: With a complete cleaning, a new litter and litterbox, and a training interval where he stays in a room until he pees, we think he’ll get back on track and do his business where he’s supposed to. Thomas: Good luck, Lynne. Please let us know how things turn out! Will my cat recover from his urinary blockage? Why Is My Cat Pooping Outside the Litterbox? My cat always has poop on his britches. Help!